Part of the 1976 Duke Kahanamoku Invitational Surfing Championships starring Larry Bertlemann. Herbie Fletcher initiates the rebirth of noseriding on a 8ft board with a squared nose derived from Gordon and Smith's The Stretch (1966) with a narrow swallow-tail introduced by Ben Apia in 1974. 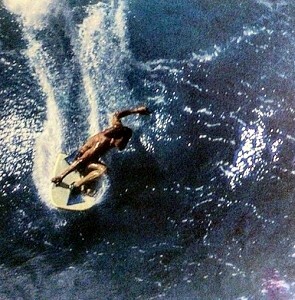 A photo of him nose riding the board at Maalaea, Maui, appeared on a cover of Surfer in 1976. Particularly suited for small waves it dominated 50% of the market by 1980..
Modern Malibu resurgence of plus 9 ft traditional Malibu template but with modern construction (light weight, note leg rope use) and design features (particularly rails) by Bob McTavish, Bob Cooper and others. Becomes an industry standard for small wave use, greying of the market and 1960’s nostalgia. Interview with Peter Drouyn outlining his man-on-man contest format. By 1972 Inshore Rescue Boats had made their appearance on the life saving scene, it was decided to set up a study group to consider the advisability of acquiring such a craft. When the report was tabled it was resolved not to buy one. Two more studies were undertaken before it was resolved in 1977 to invest in such a motorised craft. Funnily enough, the person to move the first motion negating the proposed acquisition was the member who moved to buy the craft five years later. Application was correctly made to have half of the cost borne by a Federal Government Assistance Scheme, but unfortunately the application got fouled up in the Illawarra Branch, leading to much conflict between the club and Branch. The problem was finally resolved by State Centre of the Surf Life Saving Association meeting half the cost from options not taken up from the original allocation of funds. Named after Alex McKenzie, then mine host of the Imperial Hotel, Clifton and a great club supporter, it was launched on the 4th December, 1977 by Mrs. Fitzgerald, wife of popular member Alan Fitzgerald, who was President of the Seagulls section of the club for some years. For a number of years the running costs of the craft were sponsored by Liverpool Chrysler (through Mr. Max Doyle of that Company). Unquestionably the craft has proved its work as a rescue unit, as a surveillance unit, !IS a work boat and still continues to give service in these fields." Mini Mal smaller (7 to 8 ft) version of Modern Mal above by Bob McTavish approximating first short board designs of 1967-8. No Nose narrowed nose and widened tail single fin as a response to twin fin 2 success in small waves, by Geoff McCoy. Clinker Bottom Phil Byrne (Byrne Surfboards) design Twin fin 2 with deep vee bottom and channels in front of fins to extend wave range.